I love listening to music, especially whilst doing the house work and having a good sing a long to make it more fun. I've been lucky enough recently to receive the Sharp XL-B715D All in One Hi Fi System from AO. Delivery was quick and I was eager to get it out of the box and find a space in our living room. The hi fi system arrived just in time for half term and so was the perfect time for testing it out. If you are like me, than when it comes to electrical items you like to go for brands that you know you can trust to be high quality and Sharp is definitely one of those brands. When it comes to electronics around our home I like to go for sleek and compact designs as we have limited space. The Sharp XL-B715D All in One Hi Fi System is just that and more. Being light weight and compact means that the system can be moved around easily. As its all in one you won't have to mess around with sorting out speakers and its easy to set up. The Sharp XL-B715D All in One Hi Fi System is a great system for us as it meets all our needs. 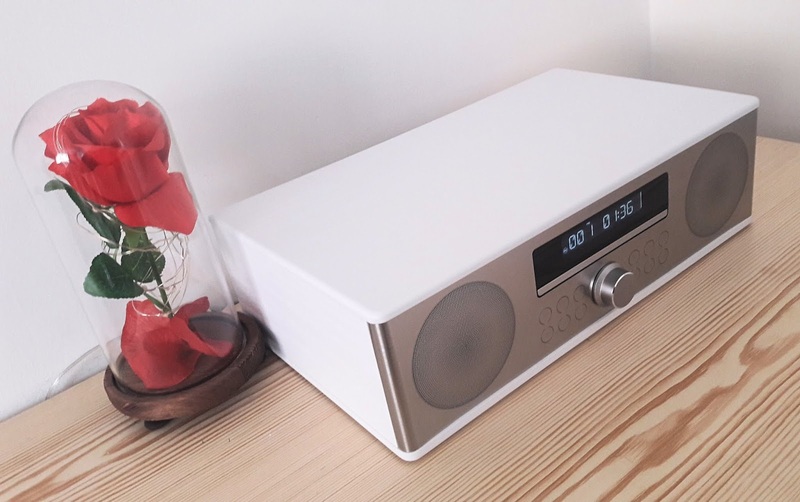 Not only is the hi fi aesthetically pleasing with its white and stainless steel design but has many great features too. First of all we can browse thousands of stations on the DAB+ tuner to find new favourites. We can also play old classics thanks to the CD player and on top of that we can stream our favourite songs from spotify thanks to it being Bluetooth enabled. On first glance you wouldn't expect this system to have all the features it does. At 36.7 cm wide it's the ideal size for small spaces. The LCD display is great size and easily readable too. With 90 watts of audio power the Sharp XL-B715D All in One Hi Fi System produces a clear and crisp sound. 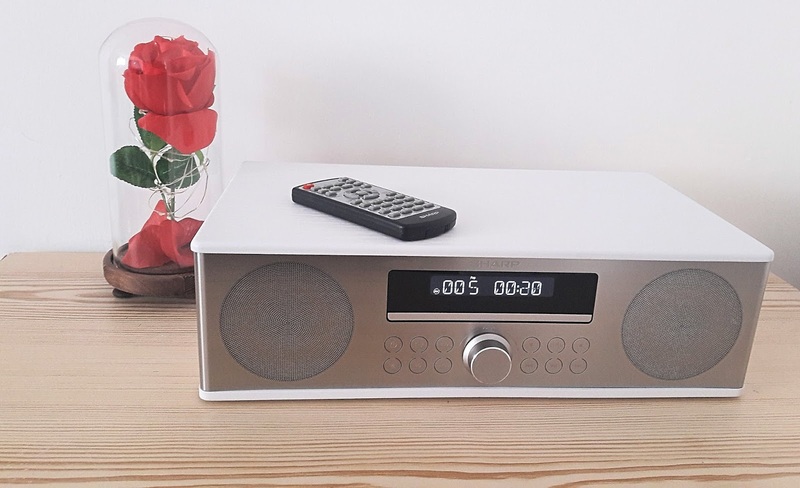 The hi fi system is easy to use and flick between using radio, the CD player and streaming via Bluetooth. The hi fi even includes a remote for easy use. 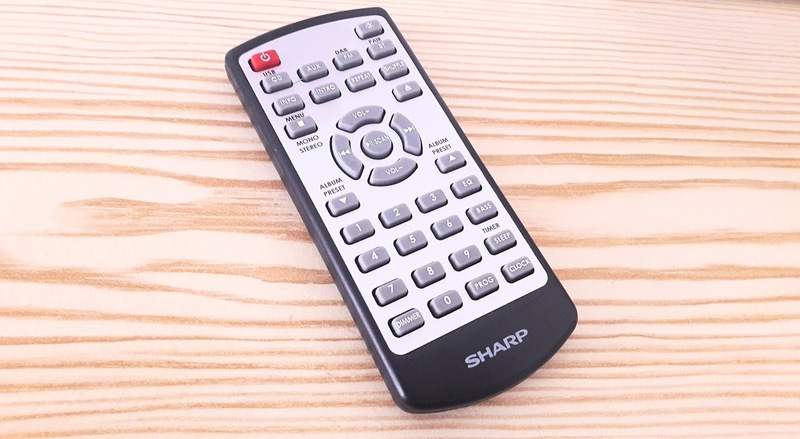 The remote is ideal so you don't have to get up or if you are busy doing other things can easily control the hi fi whether that's changing the song you are listening to or turning up the volume of your favourite tune. The Sharp XL-B715D All in One Hi Fi System also comes in Black with stainless steel as well as the white. At £149 it's a great price considering the quality and features of the hi fi system. The system is a handy addition to our home and will hopefully encourage us to listen to more music on a daily basis. That's a really neat looking piece of kit and very versatile. It would certainly get a lot of use in our house. Love that you can still play CDs on it. This is the kind of system I need in my living room. I love that you can do all those things in one and that it comes from a good make. Great system this. Not bought a hifi in years, maybe I should consider getting one again! I love that this does so much as looks beautiful too! You very rarely get the both! That looks amazing id love one of these systems for around the house. We have been talking about getting a hi fi system for a while now . This one looks fab! I love how this manages to combine modern and classic design features. It wouldn't look out of place anywhere!